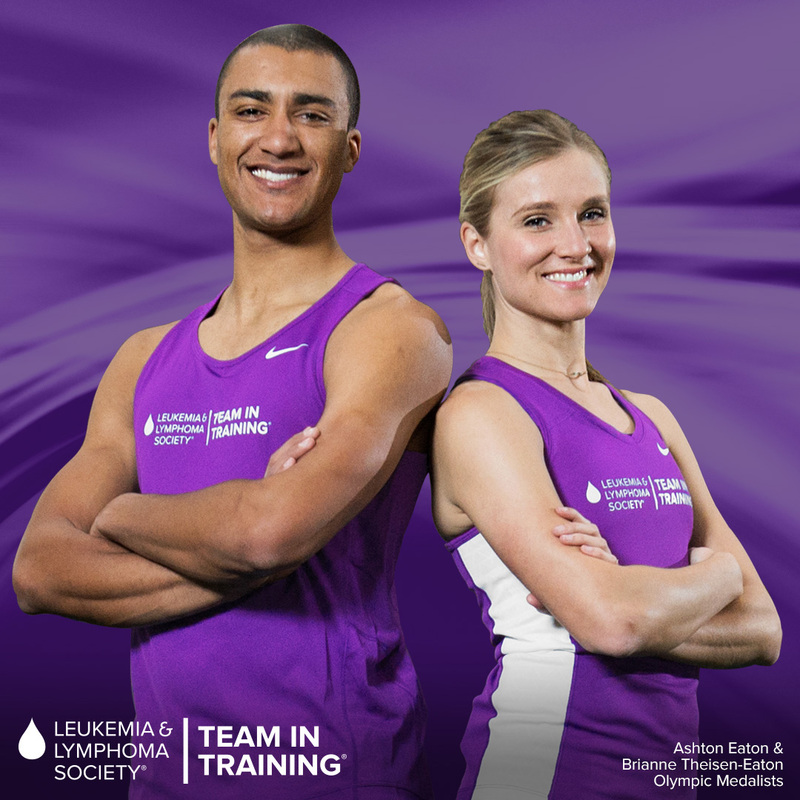 RYE BROOK, N.Y. (April 11, 2017) – The world’s first and foremost sports endurance training program for charity, Team In Training, is teaming up with Olympic track and field stars Ashton Eaton and Brianne Theisen-Eaton, to raise awareness and critical funds for The Leukemia & Lymphoma Society (LLS) in its quest to cure blood cancers, the third leading cause of cancer deaths in the U.S. The husband and wife Olympic power couple – who most recently competed in the 2016 Rio Olympics, for the U.S. and Canada, respectively, will join Team In Training as National Ambassadors, and be featured in a national campaign to celebrate its upcoming 30th anniversary in 2018. The Leukemia & Lymphoma Society’s flagship campaign “Team In Training” was formed in 1988 by Bruce Cleland, whose 2-year-old daughter Georgia had been diagnosed with leukemia in 1986. The original team of 38 runners ran the 1988 New York City Marathon to raise money for research to fight blood cancers and they were the first charity team to participate in this type of event. From there TNT has gone on to set the standard for endurance sports fundraising programs world-wide and has raised more than $1.5 billion for LLS. As it approaches its 30th year, Team In Training is once again leading the pack with new offerings to excite a changing sports endurance community. No longer just marathons, Team In Training’s portfolio includes high-caliber domestic and international events in cycling, hiking and climbing; most recently Team In Training’s first “Climb 2 Cure” team summited Mount Kilimanjaro, with more teams set to climb. Team In Training offers unparalleled support for its “teammates” to have a life changing journey with the support of experienced coaches and a community that surrounds them with camaraderie and support from start to finish line at incredible events around the world. With new technology in place to deliver a universal training and community platform, the innovative Sixcycle app connects Team In Training coaches and teammates to enhance their experience and enable them to achieve personal athletic goals while fundraising for LLS to make a difference for blood cancer patients. Ashton Eaton is a two-time gold medalist in the Decathlon, becoming the first athlete to win back-to-back gold medals in more than 60 years. He also holds numerous world records, and is a five-time world champion in both the Decathlon and Heptathlon. Brianne is a two-time Olympian, having competed for her home nation of Canada in both the 2012 and 2016 Summer Olympics. She captured the bronze medal in the Heptathlon in Rio de Janeiro this summer. The Leukemia & Lymphoma Society® (LLS) is the world’s largest voluntary health agency dedicated to blood cancer. The LLS mission: Cure leukemia, lymphoma, and Hodgkin’s disease and myeloma, and improve the quality of life of patients and their families. LLS funds lifesaving blood cancer research around the world, provides free information and support services, and is the voice for all blood cancer patients seeking access to quality, affordable, coordinated care. Founded in 1949 and headquartered in Rye Brook, N.Y., LLS has chapters throughout the United States and Canada. To learn more, visit www.LLS.org. Patients should contact the Information Resource Center at (800) 955-4572, Monday through Friday, 9 a.m. to 9 p.m. ET. 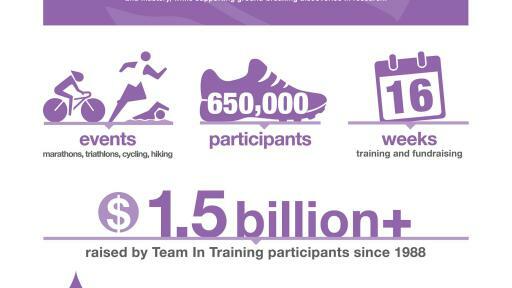 About Team In Training: Team In Training is the world’s largest and most successful endurance sports fundraising and training program. 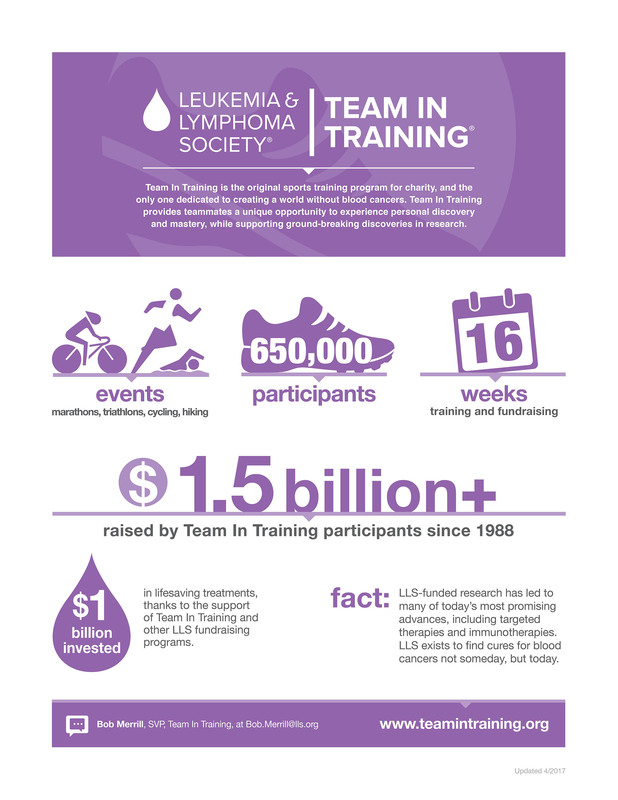 Since its inception in 1988, when a team of 38 runners trained together for the New York City Marathon and raised $320,000, Team In Training has raised more than $1.5 billion, trained more than 650,000 people and helped LLS invest more than $1 billion in research to advance breakthrough cancer treatments that are saving lives today. Team In Training offers a lineup of innovative high caliber domestic and international events, and prepares teammates for marathons, half marathons, and triathlons, as well as cycling, climbing and hiking experiences, with experienced coaches, training resources, a supportive community and world class fundraising tools. For more information about dates, locations and times, contact your local LLS chapter, call (800) 482-TEAM or visit www.teamintraining.org.